I was thinking about this again as I caught the metro home from work tonight. Twice today there’s been a man playing the piano accordion on the train – and my gosh do I love the piano accordion. It’s such a perfectly melancholy instrument: even in the happiest of songs, there’s that foreshadowing twang in a minor key. To me (and somewhat appropriately), it’s the most Russian instrument. In Svetlana Boym’s Ninochka, she uses the line “Russian soul and Russian food, bitter-sweet and rich in calories.” This idea of the ‘bitter-sweet’ or ‘melancholy’ or just distinct Russian soul is one that appears in a lot of literature. I am absolutely not re-opening War and Peace for any reason, but Tolstoy rants on about it a fair bit. I’m coming to understand what this idea of the ‘Russian soul’ means, but I’m not sure I can put it in words. 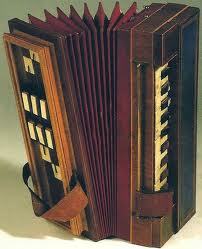 To me, it’s just the sound of the piano accordion: beautiful, distinct, richly catastrophic, and sad. Teaching earlier today, a student explained to a fellow student what I’d just said, but in Russian. I waited and added “yes, what she said.” The student then started translating into English, before I stopped her and said “no really, I understood all of that.” A third student butted in and said that “it’s Laura, she’s Russian now.” What a terrifying thought, but not entirely lacking in veracity. Skyping my bestie yesterday, she said that she was terrified of what I was turning into – how at first I let little things slide, but now I’m acting half-Russian. I know that I’ve changed – how could I not? I changed when I moved to the UK for a couple of years, to the point where I was barely recognisable to some of my former friends. Russia is, however, just a touch more extreme than England. I’ve certainly become much more emotionally aware and confrontational – definitely not a good thing. My director called me aside earlier today, after I threw a bit of a tanty on Monday. She opened by asking, point-blank, “do you hate English First?”. I replied “yes, yes I do.” I’ve never been very good at lying when asked direct questions, especially when I’m so angry. The conversation got more and more direct from there. I try to avoid writing now-days when I’m in a bad mood, because it’s almost always because of work and that’s not what I want to focus on nor remember. But working for the company is an absolute uphill battle, every day. Today my director and I put it down a little to cultural differences, and I’m not really sure we can progress from there. To me, this job is working to live, not living to work, and though I’ll do my absolute best, it’s not my career, it’s not my life, and it’s not the most important thing in the world to me. A couple of hours later, there was another confrontation in my presence, but this one not involving me. This particular class used to be an absolute joy to teach, and I looked forward to arriving and working with them. Over the past two months however, since two students left, it has absolutely deteriorated. One of the students is treated… shall we say ‘acerbically’?… by the others, who are all much older than he is. I actually have a lot of respect for this kid. He knows the others don’t like him, but that doesn’t stop or even cow him at all. He knows who he is, what he wants, and is absolutely forthright about it. Hang in the Laura I think you are doing great. Haha thanks lovely… Skillening up the world. Yeah, you looks like a russian blonde. Only stereotyped american smile betrays you. Well, Russian winters can be depressing but you’ll value high summer then. Haha that’s an AUSTRALIAN smile thank-you very much :p. It’s kind of just what my face does – I’ve tried hard to be serious in photos like a Russian, but it just doesn’t work!